I need to start with an apology as this is not quite the live blog that you might have been expecting. Not quite the start to my blogging career I’d hoped for either but with great events come certain technical issues of equal proportion and in this case the sheer turnout to the event has resulted in network issues. Maybe like most of us a healthy dose of caffeine was required to kick start it into action after an early start to the day. We’re introduced by Darren Herbert, who informs us that the session has turned into a double act and taking a more formal structure than the planned panel. Wielding a Kit Kat in one hand I accept that some of the best things come in twos, so no harm done. We’re looking at how brands and agencies are using attribution, plus delving into the eternally complex question of developing an attribution strategy – what most regard as the Holy Grail in online marketing. According to a recent Econsultancy study, 54% of companies carry out some form of attribution yet only 29% find significant value in the model they have in place. Darren breaks this down into three primary reasons: the tools on offer, resourcing issues and internal politics. In his terms there is simply a lot to overcome in order to maximise the sales yields. • Linear model – dismissed as “the most pointless” model here. • Position based model – satisfies the display companies (theme here) as they have the money to burn. • “How Google does it” – advice here is to not change this unless you’ve done the research first. If we were to get really clever we could start to look at the likes of sequence, recency, channel relationships and impression relationships. The enormity of the world of attribution is quickly starting to dawn. There are a handful of methods for attribution starting at what Darren called “the Fisher Price” method, including basic services such as Google Analytics and DoubleClick that both have limitations but act as great starting-off points. The key thing that with these is that Google has invested heavily in the UI, making it as visual and easy to use (and interpret) as possible – something that we know from Danny Ashton’s session earlier in the day as being extremely important. Moving up a level from there we have the likes of Google Analytics Premium and DC storm. Where these differ is that they track impressions and direct visits, integrate with CRMs to discount cancelled sales, attribute across acquisitions plus a few other features that you’d expect with a more premium price tag. Not stopping at cross-channel we need to also factor in cross-device, which is a very difficult task. The three existing methods each have their own pros and cons and consist of: customer ID tracking, universal logins (e.g. Google devices, Tapad in the US) and fingerprinting, which itself takes time to get credibility and confidence. But which is best? Well actually there is no real answer. Customer ID is great for existing customers but doesn’t capture the initial acquisition. Universal logins capture this part but not as well as other parts and I’ve already mentioned that fingerprinting needs time to bed in that makes it relatively inefficient. Russell McAthy now takes over the microphone and talks more about the strategy and implementation of attribution within a company. His challenges us as to whether we are over complicating attribution as a service. Are we part of the issue? According to Russell we are. And we need to start talking about it with a business at the heart. Moving onto an example, Russell cites the use of vanity or shortened URLs used on till receipts in order to track post offline sales. How they interact with the brand online after an offline purchase will provide great insights and ultimately feed into the audience segments that are mentioned with such prominence later in the talk. The biggest issue that I found when talking to business is that they see the same numbers in the same reports, but actually the budget is reallocated across the various channels. It’s not just a case of swirling the bucket around, but finding ways to make the journey more engaging. 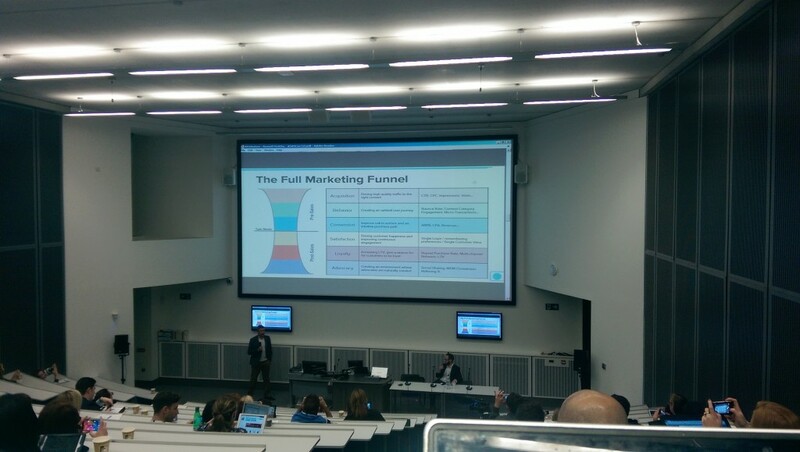 There is a planned photo opportunity next with a slide on the screen showing “the full marketing funnel” commonly used by Russell with businesses. If we take the people who come to the site and convert 3% it leave 97% of people. But talking about attribution we know that visitors come back more than once. We need to look at the value they are offering as even a bounce can provide some insight. Don’t worry about conversions or visits only. Customer value is crucial – a really great takeaway from Russell. We’re now on to examples of where we’re taking attribution, again in the context of the business. Understanding the attribution at a customer or audience segment level will give the opportunity to produce “proper” customised landing pages that are highly targeted and relevant. This can be done using cookies and negate the requirement for user log ins. Implementing big data into attribution will then allow real-time personalisation on the site. It’s possible right now, if not costed out of most companies’ budgets as it requires a single customer TRUE view database. Note that according to Russell a more traditional single customer view is misleading as it’s only summarised data. It will ask numerous questions about privacy but hey, as Russell says, we’re marketers and push privacy to the limit anyway. As long as we understand the frequency of doing it and make it seem organic the real goal is to make the customer experience better. There wasn’t a summary but I put that down to the change in the session format at the eleventh hour. It’s clear though that attribution doesn’t have a clear right or wrong. A seriously interesting talk. Thanks both.